Rated one of the leading construction companies in the city, we have successfully managed different construction projects and executed a number of contracts for customers in both public and the private sector. Our approach is not profit-based but rather customer-based as we believe that customer satisfaction is more important. Our vision is to be the most recognized and respected building and construction company and to set a benchmark in quality, process, and projects against which our competitors are evaluated. Our mission is to deliver quality products and services by providing high value to our customers and make a lasting contribution to the development of the built environment in India. We have a well qualified and organized workforce that boasts of several years of experience in various disciplines of construction, design, property management, and real estate. Our team includes in-house designers and engineers to help with design and schemes, account managers and executives, and project managers running a different crew of site engineers, site supervisors and a whole network of subcontractors. Adopting a ‘partnering’ style of management, each staff member maintains an open line of communication with customers at all times to make sure they understand what is expected of them and do what they are supposed to do to finish the project. We will be always committed to improving standard of workmanship to delivering maximum value by working hand in hand with customers, suppliers and other partners, while minimizing waste and damage to the environment. We will take a collaborative approach that strongly encourages freedom, communication, and flexibility, creating a team culture ingrained in shared success. We will innovate as a business by embracing new concepts and exploring new realms, sharing knowledge, and development of adopting an entrepreneurial mindset. We will diligently work on achieving excellence in learning and development, maintaining stakeholder relations, and focussing on environmental sustainability, health and safety. 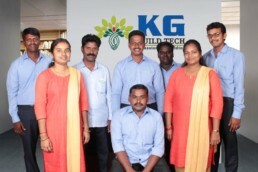 Mr.Venkatesh, Owner, KG Build Tech has very good experience & vast knowledge in constructing various types of buildings such as residential, apartment, bungalow, farmhouse, office and commercial buildings including interior design works. A wonderful people person, hard worker and sincere to his commitments. I know Mr. Venkatesh since 2010 and I'm proud to say he has a very good execution team. The team brings all our renders that we architects create to reality. The construction material quality is top notch and is never compromised. KG Construction built my home in 2014, They are very professional and friendly. Finished my home on estimated time and with good quality. The key is they provided multiple options at every stage of the construction that helped me decide choices to my needs. It’s an enjoyable Journey with them throughout the construction phase and thereafter.